Fedora 22+ now provides new tool called git-xcleaner which helps deleting unused topic branches using TUI (text user interface). It also offers mechanisms for pre-selecting branches that can be safely removed. 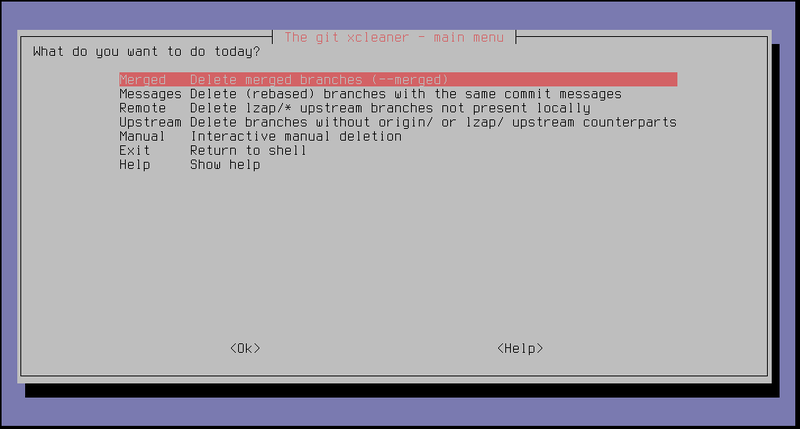 Command git branch –merged is used to find a list of branches that are marked for deletion. For each branch, tip commit message is compared against base history and if found, the branch is marked for deletion. Whole commit message is compared and it must fully match. User enters base branch name (defaults to “master”). Delete all remote branches in remote repo which are not present locally. User enters remote name (defaults to current username). All branches which no longer exist in origin or specific remote repository are marked for deletion. User enters specific remote name (defaults to current username). User manually marks branches for deletion. If you mis-deleted a branch and ignored all the warnings in documentation and on the screen, check out the homepage for instructions how to checkout your branch back.